Add the right product and your hair goes from bland to grand. The wrong product – or the right product used the wrong way – can make your hair heavy and greasy, and require you to wash it out and start the styling process all over. Use our easy styling product guide to get the right effect. Mousse is one of the most popular products because it’s so light and versatile. You can use it to hold your updo in place (it’s lighter than gel or hair spray), seal in your curls, add volume and texture, and cut the frizz. 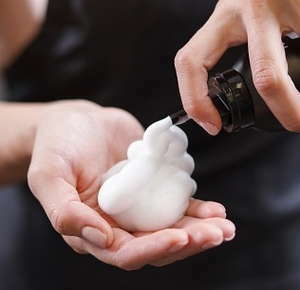 Use a golf ball-sized spurt of mousse when blow-drying and distribute it through your hair. Unlike most styling products, you can put a thin layer of mousse right at your roots for extra volume. Hair gel is your friend if you’re going for a messy, spiky look. It adds shine, and protects hair by holding in moisture. However, a light hand is required or you’ll end up looking like you have a case of the greasies. Over time, blow drying and heated tools dry up your hair’s natural oils. Heat protectant creams, sprays and serums prevent damage from repeated use of these helpful implements. Apply protectant to dry hair before styling. In addition to protection, these products de-frizz your hair and add shine. One of the oldest hair styling products, hair spray is still relevant for holding your style today. Just remember, like other body parts, hair is supposed to move. Use a soft or medium hold to avoid helmet hair. Save the stronger holds for special occasion updos and costume parties. Relaxers use strong chemicals to permanently relax curls. Usually left on for 10 to 20 minutes, relaxers are popular for straightening African American hair and other curly textures. Since these are strong products, it’s easy to over-process. If you’re new to relaxers, consult a professional. “Texturizers” can be confusing. Mostly the term has been used as a gentler form of relaxer for African American hair. This chemical concoction is used to partially remove curl – say, to go from curly to wavy. Usually you only leave texturizer on for five to ten minutes. It’s better for S-shaped than Z-shaped curls. However, the term is also used for sea salt sprays and gritty creams that add volume and beachy waves to straight hair. Gentler – and more temporary – than relaxers and texturizers, heat-activated straightening balms are used with a blow dryer to straighten curls and waves. These products often contain argan oil and good-smelling botanicals rather than harsh chemicals. Really want your hair to stay in place? Envy Elvis’ pompadour? Wax and pomades hold shorter styles, such as choppy pixie cuts, in place all day. Use sparingly, warm the wax by rubbing between your palms before applying it, and allow extra time for washing out. Silicone-based hair serums coat your hair’s surface to protect it from sun exposure and pollutants. Serums make your hair shiny and prevent tangling. After washing, evenly distribute a pea-sized drop of serum throughout your hair. If your hair is extra-dry, consider a leave-in conditioner. After washing and using your regular conditioner, towel-dry. Apply leave-in conditioner to your hair while it’s still damp. Need a little more guidance? Make an appointment today and we’ll walk you through how to use the best products for your hair type and desired style. For us, nothing is more fun than playing with your hair and finding new looks that will thrill you.